Jessica Jones #1 (Marvel Digital Originals) review: Jessica's in good hands with this new creative team – AiPT! A new creative team takes over Bendis’s baby to kick off the Marvel Digital Originals line, and knocks it out of the park. Recently, Marvel unveiled their Marvel Digital Originals initiative, a series of digital-only comics through comiXology and their own Marvel app focusing on superheroes appearing in Marvel’s television efforts. First up was Jessica Jones, who has been handed off from her creators, Brian Michael Bendis and Michael Gaydos, to Kelly Thompson and Mattia De Iulis following Bendis’s exit from Marvel Comics to join DC. I have been a huge fan of Bendis and Gaydos’s Jessica Jones series, so I had cautious optimism for this new approach. I’m happy to report that Thompson and Iulis have absolutely knocked it out of the park. 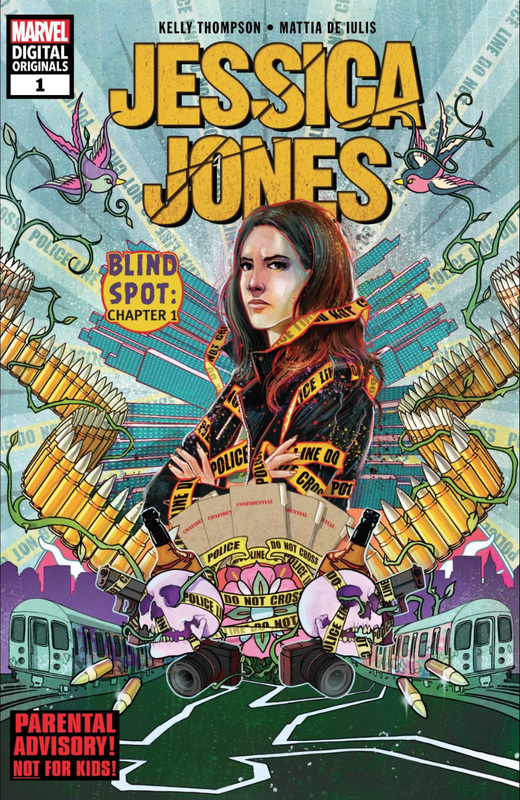 From a writing perspective, Thompson seamlessly captures the essence of Jessica Jones, launching into a new mystery that interferes with Jessica’s personal life (isn’t that always the case?). Some familiar faces are brought into the story as well — especially in the second part of the story — that help connect Jessica to the greater Marvel universe in ways that aren’t always done. Speaking of which, this is a two-parter, an opening double-sized issue dubbed “Blind Spot” that kicks off the new series. The first issue ends in an appropriately shocking cliffhanger, but thankfully we don’t need to wait any time at all to find out what happened. At SDCC this year, Marvel editor-in-chief C.B. Cebulski touted that MDO is a way to “binge your comics,” and packing two standard-sized issues into the first release is a good way to illustrate that. The big question mark going into this series for me, though, was Mattia De Iulis’s artwork, for two reasons: One, I was completely unfamiliar with his work, and two, Michael Gaydos’s artwork in both Jones and the Alias series that created the character was so distinctive. His painterly drawings accompanied by dour, dull colors helped give Jones a unique feel unseen in almost any other comic book. Thankfully, Iulis doesn’t attempt to emulate the style, and instead provides an amazing new spin on the feel of Jessica Jones. It’s really hard to describe how much I dug the art on this book. You’d be hard pressed to find an art style more different from Gaydos’s, but good god, does it work. His rotoscope-style artwork provides a feel that’s at once realistic and otherworldly; it’s like you’re watching A Scanner Darkly. The shading, the character models, the bright colors that should be at odds with the dark themes of a book like Jones — they all combine into a beautiful package. While I always appreciated Gaydos’s style, I bemoaned how it could sometimes be hard to assess a character’s emotion from their facial expressions. Iulis brings a style to the table that’s completely different, and I absolutely love it. It does feel a bit brighter and as a result, more realistic than the noir feel of the previous series, but this series does retain some of the character’s trademark grittiness, best seen in the charred papers and fingerprint dust in Jessica’s office. Another neat artistic flourish is how every little thing Jessica notices on a person due to her years of being a P.I. is shown as a Polaroid-type photograph overlaid on top of the person she’s looking at, complete with captions detailing Jessica’s observations. It’s a neat detail that really enhances Jessica’s character and strengths. Seriously, Mattia De Iulis is going to be a superstar artist in a few years’ time. Mark my words. With great storytelling and stellar artwork, Jessica Jones‘s new creative team knocks it out of the park. An interesting mystery packed with familiar faces is complemented by colorful artwork that seems like it shouldn’t work for such a gritty series, but absolutely does. If “Blind Spot” is any indication of the quality of books to come out of the Marvel Digital Originals line, count me in for all of them. With great storytelling and stellar artwork, Jessica Jones's new creative team knocks it out of the park. An interesting mystery packed with familiar faces is complemented by colorful artwork that seems like it shouldn't work for such a gritty series, but absolutely does. If "Blind Spot" is any indication of the quality of books to come out of the Marvel Digital Originals line, count me in for all of them. Kelly Thompson nails Jessica Jones's characterization and the overall feel of a Jessica Jones story. A host of familiar faces in this one. Mattia De Iulis's artwork is absolutely beautiful. So different from Gaydos's style, but it works flawlessly, breathing new life into the series. I don't have any negatives here. I loved this book.